Add the ability to pay with a check through Authorize.net eCheck. Plug n play functionality. Upload the Authorize.net eCheck plugin and activate. Select a condition if applicable (for example if you have a radio button called ‘Payment Method’ and ‘Pay by check’ is checked, show the echeck fields). 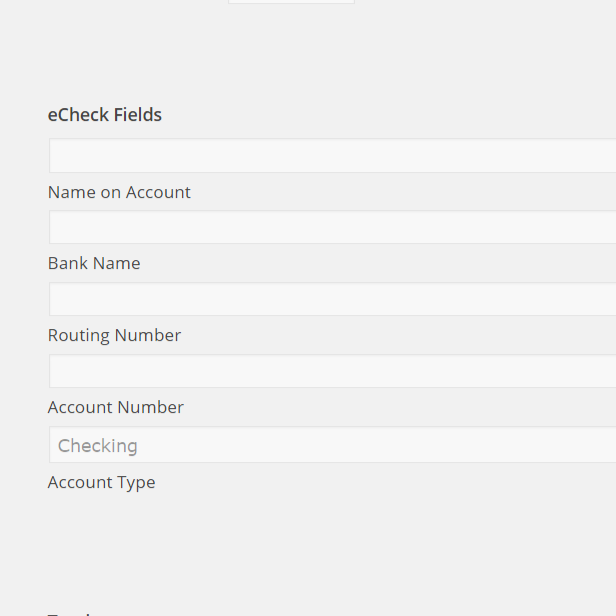 If the echeck fields are displayed to your customer, they are required. So you must conditionally show them if you also display a credit card field. Select a condition if applicable (for example if you have a radio button called ‘Payment Method’ and ‘Pay by check’ is checked, process the feed and the echeck fields). Works with Gravity Forms Product and Subscription fields. The plugin is built upon a very stable platform (Gravity Forms Payment Addon) so should work for a long time. I will update as needed and make updates available after the 12 month window at a reduced price.